VOB files are found on DVDs and are the containers that house all of the video, audio, subtitle and EPG data for the movie. Despite its wide use, the default player that comes with macOS does not support it. So how do you play VOB files on Mac? The good news is that there are many free VOB players for Mac that can assist you to play VOB files on Mac with ease. Developed by VideoLAN project, VLC is a cross-platform player that is portable, open source and free to use. A number of audio and video compression formats including DVD-Video, streaming protocols, and video CD are supported by the player. So if you are looking for a simple solution on how to play VOB files, the VLC media player is there for you. In addition to all popular operating systems, the player is also available for mobile and digital distribution platforms including Windows Phone, Android, iOS, Google Play, Windows Store and others. MPlayerX is built using two open source projects - FFmpeg and MPlayer and it supports a large variety of media formats. You can play YouTube, Vimeo and other videos by using MPlayerX in a few clicks. Even if your files are not in a playlist but are numbered in a logical pattern and are in the same folder, then you can play VOB videos on your Maс in the right order. MPlayerX also allows you to watch your favorite movies on your home theater system as it recognizes the SPDIF cable. MPlayer is another powerful media player that can play VOB files. It is a legit app that works on Windows and Mac and contains most codecs you are likely to need within the installer. The process is the same as for VLC so I won’t repeat it here. Just install, set it as the default media player and play the DVD. MPlayer will also play most other formats by default too. This VOB video player is free of charge and available for all popular operating systems and mobile platforms. KMPlayer offers various preset configuration options for users to customize video parameters for different demands. However, for new users, the interface is a little complicated. But once you are familiar with those functions, you will find KMPlayer is such a versatile and useful tool. This .vob player enables you to play various media files including online VOB videos and DVD, DVD VOB files. All above listed players will not work with encrypted VOB files which are stored in the Video_TS directory at the root of a DVD. Therefore, to play encrypted VOB files on Mac, you will need a specific application. Here, you can get the job easily done by downloading Pavtube ByteCopy for Mac, which has perfect importing support for both unencrypted VOB files and encrypted VOB files. Here, you can easily transcode VOB to Mac computer more compatible MP4, MOV file formats with perfect quality and super fast conversion speed for conveniently viewing on Mac computer with QuickTime Player or transfer to iPhone, iPad or Apple TV. To get the best output file quality, just feel free to tweak the output video codec, resolution, bit rate, frame rate and audio codec, bit rate, frame rate, sample rate, etc. Step 1: Load VOB files into the application. Download the free trial version of the program. Launch it on your computer. Click "File" menu and select "Add Video/Audio" or click the "Add Video" button on the top tool bar to import source VOB files into the program. Step 2: Output Mac supported file formats. 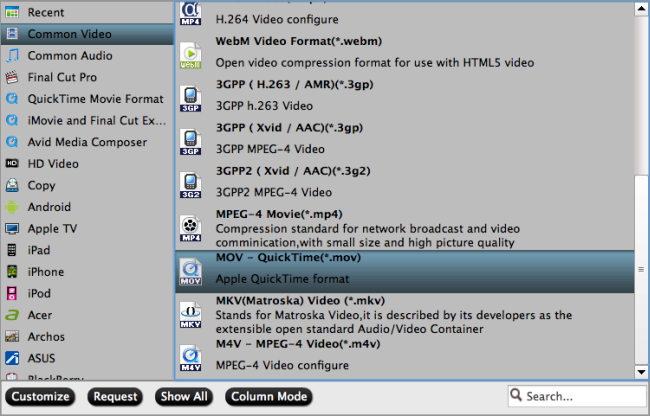 Clicking the Format bar, from its drop-down list, select one of QuickTime player native playback digital file formats such as "MOV - QuickTime(*.mov)" under "Common Video" main category. Tips: Click "Settings" on the main interface to open "Profile Settings" window, here, you can flexibly choose or specify exactly the profile parameters including video codec, resolution, bit rate, frame rate, audio codec, bit rate, sample rate, channels, etc as you like to get better output video and audio quality. After all setting is completed, hit the "Convert" button at the right bottom of the main interface to begin the conversion process from VOB to QuickTime Player playable QuickTime MOV file formats. When the conversion is finished, click "Open Output Folder" icon on the main interface to open the folder with generated files. Then you will have no problem to view VOB files on Mac.